Chess: it’s a simple game but it’s also very complex. It’s called a ‘sport’ by the Olympics. All around the world, we can find people in the park or in special cafés, staring at the chess boardand the many pieces on it, sometimes for hours, trying to think of the best move. And, though it’s called a sport, you don’t need to be strong to play it. However, you do need some strong mental skills and, if we believe the experts, a good memory helps people to play better as well. Perhaps surprisingly, intelligence doesn’t matter and ‘luck’ plays no part in the game. Let’s start with a quick look at what you need to play. A modern chess boardhas sixty-four squares in a larger square, which means that each side is eight squares long. This is the same board that can be used for a few other games, for example draughts. For chess, each player has sixteen piecesorganised in two lines of eight at one end of the board. The line nearest to the edge has different pieces, which move in different ways. At each end of this line is a ‘rook’, also called a castle. Then, there is the ‘knight’ (meaning a horseman), two bishops and in between the two bishops are the king and the queen. 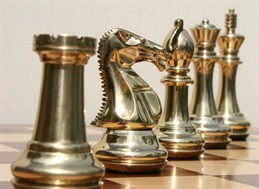 In the line in front, there are eight ‘pawns’ which do not have the power of the pieces behind them and are not so important. One person’s piecesare white and the other’s are black. White goes first, which gives a very, very small advantage. The only limits on what moves a chess player makes are the rules. It is important to remember that chess, unusually, is not a ‘game of chance’: there are no dice, for example. If you lose at chess, even just one game, that’s because the other person played better than you. The fact that there’s no luck means that it’s very difficult for a weaker player to beat a stronger player. So, why do these games happen? Because the weaker player can learn a lot by playing someone better. And how do you win? By catching the other player’s king in a trap he can’t escape from. If you do this successfully it’s called ‘checkmate’. Sometimes, both sides become weak and short of pieces and the game may fall into a round of the same moves over and over again – and the game is given as a draw. It all began about one and a half thousand years ago in Cental Asia or Iran. This originalgame was really not very different from the modern one, with just a few different rules. They believed that it helped to make young people cleverer, especially in war, using their brains as well as just strength. The game arrived in Europe about a thousand years ago by two routes. It came through Russia. Even today the Russians love chess and many of the world’s best players were and are Russian. It also came in through North Africa into Spain. It was only really in the middle of the 19th century that the game had fixed international rules and some competitions began. From this time on, interest started to grow stronger. Some people began playing by post. Nowadays, it’s much quicker because you can play on the internet in real time. And that’s not all computers have to do with chess. It’s more and more difficult for even very good human players to beat ‘software’. Computers are also used to know the game better because they can check all the possible ways a move can go in just a few seconds and choose the best one. This is what players have to do using their brain and that’s why a good memory is so important.